When seeking to add a touch of nature to an interior, a decorative item such as this ‘sandpipers on driftwood’ wall sculpture will work a charm. It brings in the natural beauty of real Florida driftwood together with the artistic representations of sandpiper birds, a well-known shorebird common to both the Atlantic and Pacific coasts. If you are looking for wall sculptures to add to a nautical or coastal themed room, then this sculpture is a great possibility. The sandpiper on driftwood sculpture is handmade and features discovered wood from the beaches of Florida. The bird figurines were cast in durable resin and have been decorated with the markings associated with this particular species. When seen as a group and from afar they appear very lifelike. The sculpture as a whole can be hung on any type of wall and will look great in various positions such as above a doorway; over a sofa; next to the stairs; or alongside other sea themed decorative items. 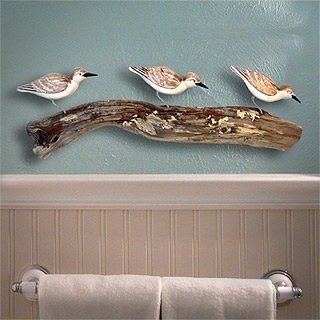 You can buy it from here: Sandpipers on Driftwood Wall Sculpture. Dimensions: Approximately 7″ tall x 20″ wide. Peacocks are known worldwide for being the beautifully colourful birds with the dazzling tail feathers that are used to attract potential mates. This hand-painted wooden peacock is fine example of this stunning bird being inspiration for creative craftsmen skilled in wood carving. The Indian Peafowl (peafowl being the name of the female bird) is the national bird of India from where it is believed to have originated. The species has since, however, spread to all the continents of the world thanks to mankind. Made from hand-carved wood, the wooden peacock sculpture has been given a rich mix of colors including green, blue, and red hues with golden accents. It has been made by skilled artisans in the north-west Indian state of Rajasthan which is well-known for its popular arts and crafts. The region has become a foreign shopper’s paradise with its huge array of decorated wooden furniture, handicrafts, blue pottery, carpets, and prints. Due to the individual nature of each piece, no two are the same, making the uniqueness and personal quality of each peacock statue more pleasing. 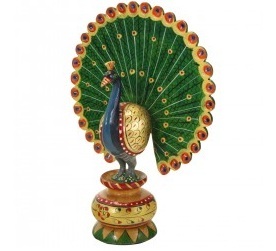 If you have a fondness for Indian culture and love the artistic qualities of the beautiful Indian Peacock, then this wooden decorative sculpture will make a lovely addition to a table, shelf, mantel, or glass cabinet in your home interior. It will go particularly well with South Asian themed décor as well as spaces needing an injection of color to brighten up a particular spot. The detailing of the peacock is quite sublime and the skill required to make sure a delightfully curving representation of this remarkable creature is astonishing. It’s certain to become a prominent feature in whichever room it is placed. You can buy it from here: Hand-Painted Wooden Peacock. It measures 9 inches tall and 6 inches wide and comes in a special velvet box. This delightful and charismatic penguin sculpture made from hand-blown glass reminds me very much of a story I read in the newspapers a few days ago. An elderly Belgian man had for decades dressed and behaved like, and indeed thought of himself, a penguin. The residents of his town would cheerfully greet him as he waddled down the street. This glass sculpture is more elegant, refined and decorative however and will sit well on a prominent table-top or shelf. 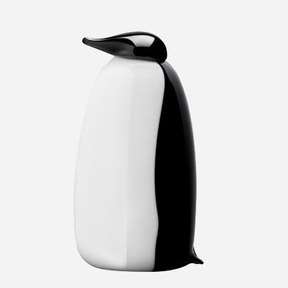 The penguin sculpture is the creation of Finnish designer and glassblower Oiva Toikka and his renowned Nuutajarvi Glass Factory, which is the oldest in Finland. The ingredients which go into the making of the various bird designs that come from the factory include sand, soda, lime and fire. Red-hot glass melts into a mass in the kilns before being brought out and shaped into beautiful animals. Each bird is individually mouth-blown by between 3 and 5 skilled glassblowers. This means each creation is unique and has its own special character. By the way, no paint is used in the process and the different tones, including white and black are achieved purely by varying glass blowing processes. Penguin birds are highly recognisable creatures and this is why they make great decorative themes and have been portrayed in countless movies, books and works of art. The birds are also popular amongst collectors of small décor items, trinkets and fine art due to their loveable walks and their distinctive features. This hand-blown glass penguin sculpture will catch natural daylight wherever it is placed and is sure to add a distinguished feel to the interior ambiance. You can buy this sculpture from here: Hand-Blown Glass Penguin Sculpture. 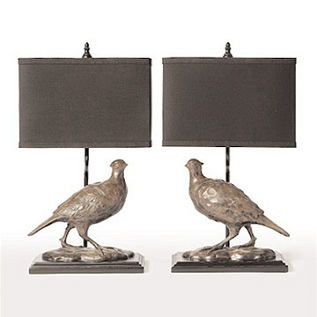 Quails are one of the most distinctive birds you can hope to see and this is probably a good reason why this pair of Quail table lamps by Barbara Cosgrove was created in the first place. The small stocky game bird with its long pointed wings and short legs also makes it a favourite amongst birdwatchers, and unfortunately, hunters. Throughout history, quails and similar species of birds such as pheasants and grouse have been encouraged as a source of food and sport. Barbara Cosgrove’s quail table lamps feature a walking quail below the main lampshade. Each quail can either be seen walking towards each other or away from one another and thus provide an excellent matching feature for placement on a table, shelf, mantelpiece or cabinet. The quail sculptural features are made from resin and will add a distinctive retro glamor to an interior setting. If you like watching the old period dramas from European and American history, then these quail lamps are definitely going to be a get addition to your décor tastes. When lit, the light from the bulbs will shine upon the quails and thus highlight their sculptural beauty further. One lamp can be placed either end of a mantelpiece above a traditional fireplace or alternatively, they can be introduced to a highly contemporary interior arrangement and placed alone on an accent table or stool. The possibilities with these distinctive, fun and unique table lamps are endless. Both lamps have wide platforms and are built to last. You can buy them from here: Sculptural Quail Lamps by Barbara Cosgrove. At first you think this Billy Moon creation is in fact a real bird cage and that the label of candle holder is surely some mistake. However, when you look more closely and see the wonderfully beautiful detailing, you realise it is indeed a bird cage candle holder in antiqued metal and ceramic. I’ve written about the designer Billy Moon before on this website and his talent is clear to see. A metal tree appears to grow within the cage upon which little birds are perched, looking outwards towards the wider world. Its branches shoot out from the cage’s confines and on these are attached the candle holders. One could take a philosophical meaning from this design in that the burning candles represent the freedom from the captivity of the cage. The meaning can change depending on how you look at things. The base and pinnacle of the bird cage are highly decorated and nicely compliment the curving beauty of the branches, leaves and birds. The sculptural candle holder is as a whole a wonderfully expressive piece that will catch the light of the candles placed in the holders. With the room’s lights turned down low, the resulting flicker of the flames will cast outstandingly delicate and delightful shadows upon any nearby walls, table surfaces and indeed, on the ceiling. The bird cage candle holder has been given a heavily distressed look which lends an antiquated feel to the overall piece. It could easily be a item straight out of a classical novel from the 18th century or from an old black and white movie. 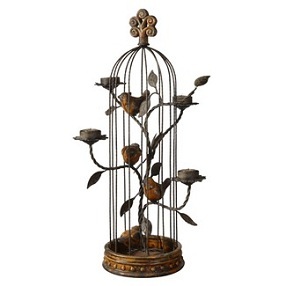 If you have a traditionally decorated interior then this bird cage candle holder will make an excellent addition. A Bohemian style living room or study will also find this to be a most welcome feature. You can buy it from here: Bird Cage Candle Holder by Billy Moon. Antiqued tea light candles included.